In this post I'm going to run through two fixes on a PS4 Controller, How to replace the battery and also how to replace the Conductive Membrane pad. Both tips are good to know if you get a water (or Wine in my case) damaged controller which isn't working. As well as changing these parts, all of the current controller parts needed a good clean as well. If your PS4 Controller is getting old and the battery doesn't last very long or turn on at all, then replacing the battery is a very simple job to do. You have to remember that opening up and playing around with your controllers can void their warranty but you've got a warranty on a controller that doesn't work so this isn't really a problem unless it's very new which means you can go back to where you purchased it from. To get to where the battery is located, flip the controller round and get to the back where there are 4 screws, you'll need a fairly small Phillips screwdriver to get to these. Unscrew the 4 screws but leave the back on at the moment. Now the reason to leave the back on, is because it's actually attached by a cable strip between the PCB and the USB/Charging port which could break if you pull the controller apart quickly without any care. The battery is easy to remove, just unplug the power cable on the left, take the battery out, place your new battery in the gap, plug in. Now re-attach the back with the screws and away you go. Your battery is now replaced and you should be good to start gaming again. After changing the battery this controller now turned on and charged which was fine however another issue was detected, two of the directional arrows on the D-pad weren't working properly which means the Membrane pad was also damaged so this would need to be changed too. Please be aware that there are a few different revisions of controller for the PS4 so yours may vary slightly. You need to ensure that you buy the correct membranes for your controller as they may differ from the ones shown here. The membrane pad is a very cheap part to buy, only £2.40 inc vat from Replace Base so it's not an expensive part. Starting from where we were above after having removed the battery, we need to carefully disconnect the data tape in the top right as shown here and undo the black screw in the middle of the board. The front of my controller now looks like this below. Depending on the revision yours may be slightly different. Here you can see the membrane pads which we're replacing. If you have undone the screw on the board just mentioned, you should be able to lay down the board from the back and you'll now be able to see where the pads fold around the back. On the back of the controller frame you can see where the membrane pads are attached, you'll need to unclip these to be able to remove them properly like the below. Use your screwdriver to help peel this off of the catch, take some care but you don't need to be overly careful as these membrane pads are being replaced anyway.You'll need to also take the trigger buttons off of the top to fully take the membrane pads off. Once the triggers are off, you can now easily take the current membranes off of the pad. Once the pad is off, we can show you why a few off the directional buttons didn't work, the liquid spilt on the controller and completely eroded away part of the pad as you can see here, zooming in was quite hard so it's a bit fuzzy but you can see where the gaps are in the tracks. Now we have taken the membrane pads, your collection of parts should look something like this. If you are trying to resurrect a controller after it has had a little too much to drink, like mine, this is a good point to give the components a good clean with some isopropyl alcohol and a lint free cloth or cotton buds. Ensure that everything has fully dried before proceeding. Now to put the nice new membrane pads on to the controller. You can now place the membrane pads back on to the controller attaching them the same way as you took them off and making sure you fold them correctly around the top and sides of the frame, then refit the triggers to hold them properly into place. Re-fit the board back into place on the controller remembering to pass the data tape back through the frame and plug it back into the PCB, rescrew the screw on the board and re attach the cable from the USB port. Close the controller and re-do the 4 screws to complete the controller back into place. 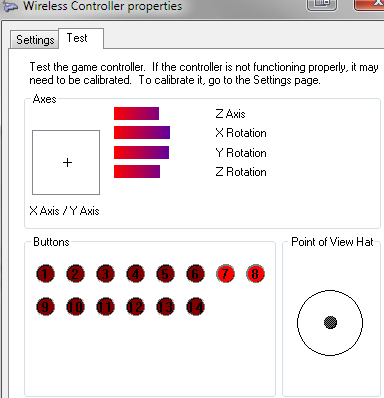 All of the buttons are now recognised, a good way to test this is by plugging the controller into your PC, search for Game Controllers which should open the Game Controllers settings box. Choose your Controller and click properties. test all of the buttons to see if they get recognised properly.